Be the first to share your favorite memory, photo or story of Maurine. This memorial page is dedicated for family, friends and future generations to celebrate the life of their loved one. 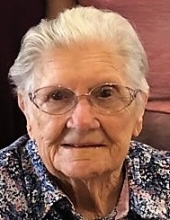 Funeral services for Maurine Culbreth, age 95, of Spring, Texas, and formerly of North Zulch, Texas, will be held 11 A.M., Tuesday, November 27, 2018 at the Madisonville Funeral Home in Madisonville, Texas. Brad Brock will officiate the service. A private interment will be in the Willowhole Cemetery near North Zulch. There will be no public visitation. Maurine Culbreth was born in Midway, Texas, June 29, 1923 to Ethel & Avis (Ferrell) Coleman, She was raised in North Zulch and grew up picking cotton. She was a graduate of North Zulch High School and a member of the North Zulch state champion volleyball team. Maurine was an excellent seamstress and made a lot of her daughter’s clothing. She was happy to sew articles of clothing for other family members, as well. Maurine was a long-time member of the Freewill Baptist Church in North Zulch. She had lived in the Houston area for the past sixty years. Maurine passed away November 21, 2018 in The Woodlands, Texas. She was preceded in death by both of her parents; husband, Truman Glenn Culbreth and brothers, Weldon & Jack Coleman. Surviving family members include daughter, Marsha Edge (Terry) of Spring; sister-in-law, Dorothy Coleman ; grandson, Kyle Edge (Nicole) and great grandchildren, Kirra O’Connor & Kaden Edge. Maurine is also survived by nieces & nephews, Wayne Coleman, Kenneth Coleman, Ronnie Coleman & Nancy Cumbie. To send flowers or a remembrance gift to the family of Maurine Culbreth, please visit our Tribute Store. "Email Address" would like to share the life celebration of Maurine Culbreth. Click on the "link" to go to share a favorite memory or leave a condolence message for the family.